Tooting has come on in leaps and bounds in recent years. It’s a popular residential destination for young professionals and families looking for a real community feel and more space in a vibrant ar-ea. And with a choice of two tube stations plus rail and bus networks, City commuters love the easy journey to work. Tooting is famed for its ‘curry corridor’, where you can enjoy cuisine from almost every country in South Asia. But if the fancy takes you something more homely, there’s also a branch of Chicken Shop on the high street, run by the people behind the exclusive Soho House. Or for a taste of London heritage head to Harrington’s, a traditional pie and mash shop; or The Castle for award-winning ales, fine food and their popular beer garden. Alternatively, try Honest burgers, for their classic Amer-ican style burgers. The Tooting Tram & Social is a local hotspot housed in a converted tram shed. Its eclectic mix of comfy sofas and spectacular chandeliers are the perfect place to savour their locally brewed beer - or pop in at the weekend for a late night boogie. Then there’s The Little Bar, which offers expertly made drinks served with accompanying platters of cheese and charcuterie. Or for a great outdoor space right on the high street, the recently refurbished Trafalgar pub is always a popular choice. Over the centuries it’s been called Totinges, Totynge, Toting, Tootting and Towting — but we’ve known it as Tooting since 1767. There are various theories behind the name: that it was named after a Saxon Tribe called the Totas or Totingas; it’s a variation of a word for 'lookout place’, or that it was once a trading post, possibly related to our word ‘touting’. What does seem likely is that there were people living here in Roman times. The Road from London to Chichester (known as Thane Street) passed along the current Tooting High Street; and since it had to cross the river Graveney it would have made an ideal location for locals to farm and sell their produce to passing travellers. Catch a movie at the weekend in a cordial atmosphere at the Gorringe Park Pub Cinema. Or head to Tooting Market or Broadway Market (see below) for all kinds of great food, fashion, shopping and more. Then there’s the Tooting Foodival — an annual gastronomic event celebrating all that's great about locally-grown produce. The aim of Foodival is to show you can grow local, eat local, be sustainable and have fun while you do it. Tooting’s two eclectic indoor markets are just a few metres apart. Tooting Market has a fantastic multicultural vibe, while the larger Broadway Market with over a hundred stalls is one of the biggest in London. Both open six days a week. Tooting is also a favourite haunt for dressmakers amateur and professional, thanks to the host of small, family-run fabric market stalls and outlets along the high street. An impressive green space of over 200 acres, popularly known as the Tooting Commons, lies at the northern end of Tooting. Historically it was two separate parks - Tooting Graveney Common and Tooting Bec. 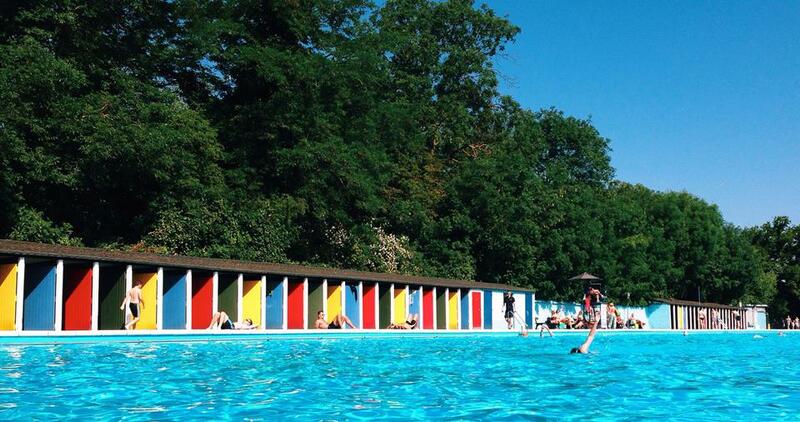 Tooting Bec Common is now home to the famous Tooting Lido, which at 91 metres long is the biggest open-air swimming pool in the country. It’s open to all from late May to the end of September. Or, for something a little more sedate, there’s the Central London Golf Centre on Burntwood Lane, which boasts a nine-hole golf course and a floodlit driving lane. It’s open seven days a week. Tooting Bec and Tooting Broadway stations are both on the Northern Line, linking the area to Water-loo or London Bridge in about 20 minutes, and Moorgate in 25 minutes. Thameslink services run through Tooting station, with trains to St Albans via Blackfriars to the north and Sutton via Wimbledon to the south. Tooting is also well served by buses, with routes 44 (Victoria), 57 (Kingston), 77 (Water-loo), 333 (Elephant & Castle) and 355 (Brixton) all passing through. For night owls, the N44 will get you home safely. And for cyclists, Tooting is on the CS7 cycle superhighway, offering a faster, safer route into the City. Popular choices for younger children include Hillbrook School, St Boniface Roman Catholic Prima-ry (Christian), Gatton Primary (Muslim) and Broadwater Primary. For the older age group, options include Graveney School, Ernest Bevin School (boys) and recent RIBA National and London Awards winner, Burntwood School.